There aren't many manufacturers taking the router/extender approach to Wi-Fi Systems. NETGEAR's original Orbi showed that extender-type Wi-Fi systems can be very effective at increasing Wi-Fi network capacity and coverage by using high-bandwidth dedicated 4x4 5 GHz backhaul. The company then more recently followed up with its "mini" Orbi RBK30 and RBK40 models that were also pretty effective, even with their dedicated backhaul reduced to 2x2. 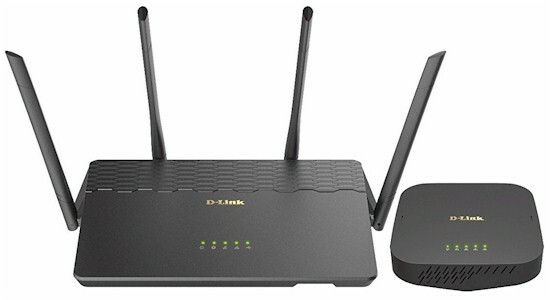 D-Link's COVR-3902 AC3900 Whole Home Wi-Fi System (Covr from here out) is trying a different Wi-Fi System approach, pairing a 4x4 AC2600 class MU-MIMO router and 2x2 AC1300 class MU-MIMO extender. Add the two numbers up and you get the inflated "AC3900" in the product's moniker, which is in line with how many manufacturers are playing the numbers game with Wi-Fi systems. There is no dedicated backhaul in this design; the extender has only one 2.4 and one 5 GHz radio that must share client (fronthaul) and router (backhaul) connection duties. The router is a straightforward four-stream design with gigabit Ethernet WAN (1) and switched LAN (4) ports. There's a USB 3.0 port on the front right that supports SMB file sharing and UPnP media serving. There are even screw mounting slots on the bottom that will point the rear panel toward the ceiling if you choose to wall mount it. The extender is a simple beast that has no USB port, but comes with a two-port gigabit switch. It also has screw mounting slots on the bottom. Router and extender have their own part numbers—COVR-2600R, COVR-1300E—but were known at time of introduction as DIR-883 and DAP-1655. D-Link released the inside FCC ID photos, which provide enough closeups to identify all components except the external power amp/front ends. The photo below with the top popped shows heatsink plates and wiring for the four dual-band external antennas that attach via RP-SMA connectors. The board photo with heatsinks and RF can tops removed shows where the major sections lie; switch at top, CPU and RAM below and radios at photo left. The Extender board also has heatsink plates on top and bottom. This is the first time I've seen antennas mounted directly on a metal ground plane. Here's the naked extender board. The FCC document has other photos showing many of the key components, which are summarized in the table below with Orbi mini and TP-Link Deco M5 that I'll be comparing Covr with later. Still no sign of anyone else except Qualcomm at the heart of Wi-Fi systems.